Superior Drummer’s new UI is both slick and highly customisable. The revamped Drums page provides multiple sub-panels for sound editing and access to the new Song Track. 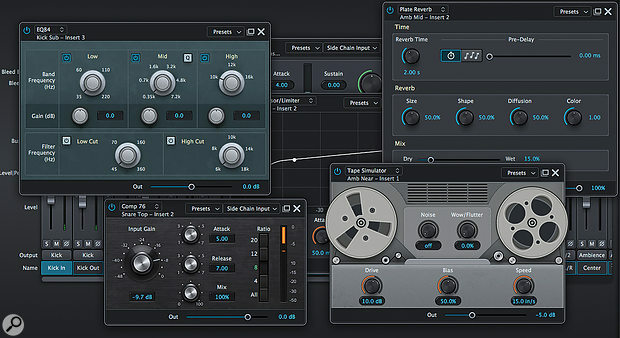 We reviewed Toontrack’s Superior Drummer 2 back in December 2008 and, with numerous updates and new expansion-pack content since then, SD2 has maintained its position as one of the most popular choices for musicians wanting a top-end virtual acoustic drummer — despite some undoubtedly brilliant competition. However, Superior Drummer 3 is now upon us and, almost nine years on, I think it is fair to say that expectations are high. So, just how have Toontrack attempted to make Superior, well... even more superior? As shown in the various screenshots, SD3 has received a complete visual overhaul. The new look is modern but, despite the visual differences, transitioning from SD2 to SD3 is pretty painless. More importantly, while there are lots of new and improved features, the core functionality remains intact. High-quality drum sounds based upon super-detailed drum sampling, comprehensive mixing and a huge catalogue of MIDI drum grooves still lie at the heart of SD3. Existing EZ Drummer and SD2 content is also fully compatible with the SD3 environment. So, UI aside, what’s new? Well, quite a lot, but let’s start with the new core library. This runs to over 230GB, and includes six new acoustic kits as well as around 350 electronic drum sounds and a small collection of percussion instruments. Within the main kits there are plenty of choices, including more than 30 snares and nearly as many kick drums. All the samples are presented at 44.1kHz/24-bit and playback within the engine goes from standard stereo right up to 11.1 surround courtesy of original recordings that exploited an impressive array of room/ambience microphones. 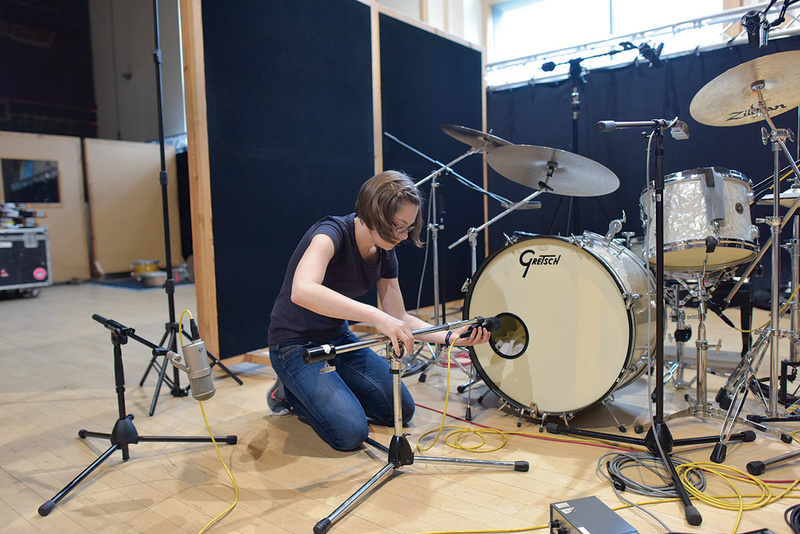 And, as recording legend George Massenburg supervised the recording process in Belgium’s hugely impressive Galaxy Studios, you can have considerable confidence in the underlying audio quality. As before, SD3 can operate as either a stand-alone application or a plug-in within your DAW. All the usual plug-in formats are supported. Upgrades and crossgrade options are available as is (for an extra cost) an SSD containing the full sound library, which is useful if the prospect of downloading 230GB is not something you wish to contemplate. 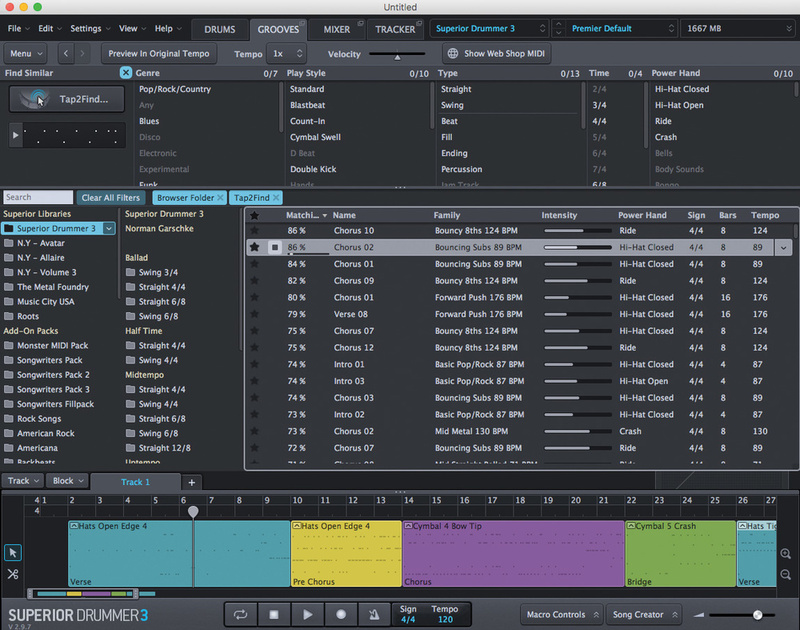 Toontrack’s slick Product Manager software handles all authorisation and installation duties. The new UI does have some familiar elements. For example, the top edge contains the main menu drop-downs, tabs for the four main screens — Drums, Grooves, Mixer and Tracker — and, on the right, drop-downs to access the sample-library presets. On the far right of this strip is a RAM usage indicator; while some of the SD3 kits have a sizeable RAM footprint, there are various resource streamlining options available both here and within the Performance tab of the Settings menu. Looks aside, the UI now offers very flexible options for customising the layout. So, for example, you can resize the main window and, from the View menu, you can also ‘scale’ the display. In addition, each of the Grooves, Mixer and Tracker screens can be detached and floated. Whether you have a large or small screen, you can find your own perfect fit for SD3. As before, the Drums page is where you configure your kit. As well as the very smart overhaul of the kit graphics, the various sub-panels used to customise your kit have been reorganised and now all appear on the right. You can toggle these panels open/closed as required and also customise which panels appear or are hidden. Along the bottom edge of the Drums page, SD3 now has an integrated Song Track, which is also visible on the Grooves and Mixer pages. MIDI grooves can be dragged and dropped here to build your drum performance. Very usefully, you can also create multiple tracks to experiment with different performance options. Playback follows your host when SD3 is working as a plug-in. This zone can also be resized as required. I’ll say a little more about Song Track editing options below. 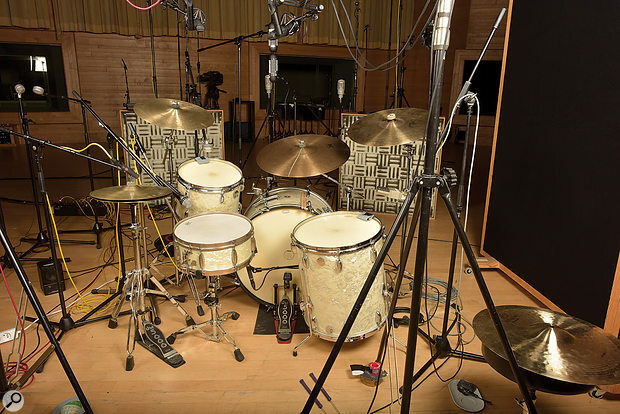 This should give you some idea of the scale of the recording behind Superior Drummer 3.As mentioned above, SD3 ships with an impressively weighty sample base, the highlights of which are six new acoustic kits based upon Gretsch, Ayotte, Pearl, Yamaha, Premier and Ludwig drum sets. There is also a very diverse preset collection that covers a huge range of musical styles and includes options such as sticks, mallets and brushes. You also get the option of adding ‘extra’ X-Drums to expand your kit configuration. As before, you can customise your kit in a multitude ways. The right-hand side sub-panels include numerous options on a per-kit-piece basis, including, amongst other things, level, tuning, humanise and, in the Pitch FX tab, the ability to define a pitch envelope. However, beyond these panels, SD3 offers four highlight features for kit customisation. First, there is a fully featured instrument browser, with a range of different filter options. Second, you can now mix and match any kit piece from any of your SD libraries or expansion packs within a single kit. Custom graphics are provided for the full back catalogue of SD expansion packs. This SD2 content seems to slot into SD3’s Mixer environment, despite having originally been recorded with a somewhat different array of microphone choices. You can now stack multiple sounds within SD3, with a full range of editing options for each drum within a stack.Third, a new drum-stacking feature allows you to fully capitalise on this mix-and-match capability. This allows you to layer multiple drums into a ‘stack’: for example, you could built the ultimate kick drum by combining several acoustic kicks and a couple of electronic sounds. The stacking capability is built into the drum browser, and any stack is then shown within the main Drums window whenever the kit piece is selected. Each layer of the stack can also be selected for individual editing via the sub-panel tabs. Fourth, you can now import your own samples. This appears to be a ‘one sample at a time’ feature at present, but it’s great for bringing in of your favourite additional electronic sounds to expand on SD3’s own offerings. However, if you are prepared to put the time in with the stack feature, you can import multiple samples and use the Level and MIDI Velocity Gate sub-panels to create some velocity-based sample switching. The revamped Grooves tab now offers a much more sophisticated environment, with numerous filter options to browse and search amongst your SD MIDI drum clip library. The central results pane allows clips to be auditioned, and your chosen clips can be dragged and dropped to your host DAW/sequencer or to the new Song Track zone at the bottom of the window. However, aside from manual filtering/browsing, there are several new features here that combine to make going from a single clip to a complete song-length drum part incredibly simple. For example, top-left of the Groove tab are two large buttons: Tap2Find and the MIDI Drop Zone. If you have already found a single MIDI loop you like, you can drag and drop it from the results pane into the drop zone. SD3’s search algorithm will then use that pattern as part of the criteria for suggesting other loops that may work with it. However, what’s really clever is the Tap2Find button. Hit this and you are presented with a blank two-bar MIDI clip into which you can play (for example, via your MIDI keyboard) some basic elements of a drum pattern. This might be just a kick, or some combination of kick and snare, but the pattern will simply loop while you overdub until you are happy with the basic idea. You then hit the Show Results button, whereupon SD3 searches the clip library to find MIDI loops that closely match, or would work alongside, the basic pattern you have created. In a songwriting context, when you have a guitar or piano idea and can ‘hear’ the drum part in your head, in an instant, Tap2Find will pull something similar out of the library. The Grooves page offers MIDI groove searching/filtering and (top left) the brilliant Tap2Find option. And then we have the Song Creator. Once opened, this sub-panel also includes a MIDI Drop Zone, and you can drop a clip here from the Results pane or your own Tap2Find creation. The rest of the Song Creator panel is then populated with a selection of clips that might make suitable options for verse, pre-chorus, chorus and so on. These can be individually dragged and dropped to the Song Track, but drag and drop from the Song Structures section and you get an instant, fully formed, song-length drum performance ready to audition. A number of typical song structure formats — AAA, ABAB, ABCABC, and so on — serve as useful starting points but you can also create your own. This workflow combination of Tap2Find, the Song Creator and the Song Track is hugely impressive — and it has taken be way longer to describe it than it actually takes to go from a basic kick/snare pattern in your head to a suggested song-length drum performance in SD3. Brilliant! To round things off within the Groove screen, SD3 now also includes a range of ‘Play Style’ editing options and a full-blown drum grid editor. Double-clicking on a clip in the Song Track opens a new tabbed window. The Edit Play Style page lets you adjust the number of hits and the velocity for each individual drum within the pattern. Kick too busy? You can easily dial it back with the Amount knob. Hats too quiet? Add a Velocity offset. If you need more control, the Grid Editor panel provides a well-featured MIDI editing environment similar in style to the Cubase Drum Editor. And if you need more options, then the Block menu positioned at the top of the Song Track section offers all sorts of extra features. For example, there is a Remove Kit Piece feature that quickly strips out the MIDI hits for an individual kit piece within any selected MIDI clip. Miking up the Gretsch kit in Galaxy Studios’ main hall.Finally, the Track menu also allows you to add a tempo envelope to the Song Track and to insert time signature changes. These are perhaps of most use when using SD3 stand-alone rather than as a plug-in but, even so, the feature is well implemented and it’s great to see this level of detailed control. SD3’s Mixer does, of course, include a comprehensive set of options for managing audio routing, multiple outputs, bleed from each drum channel, insert and send effects and buses (for both effects and for creating drum subgroups). Amongst all these features and new elements, two things are perhaps worth really highlighting here. First, given that all the new SD3 kits have been sampled with enough microphones to offer 11.1 surround, the Mixer can offer a huge number of options in terms of ‘ambience’ channels. These are available even if you are simply working with a stereo output as the channels are just presented to you as alternative ambience choices. In short, SD3 has a staggering array of options for defining the ‘space’ within which your virtual drums are sitting. SD3’s mixing features are comprehensive, with full access to all the room mic combinations even when working in stereo. Second, unlike the modest offerings of SD2, SD3 is supplied with an impressive selection of 35 dedicated effects for use within the Mixer. These include multiple types of delay, distortion, EQ, dynamics, reverb and modulation. For example, in the dynamics section there are choices for transient control, adding punch, basic compression, ‘boutique’-style compressors based upon the 1176 and the Fairchild 670 as well as a multiband compressor and a frequency gate. The distortion category includes a very nice tape simulator, while there is also a very good tape delay, and, if the mic-based ambience isn’t enough for you, some high-quality reverbs. SD3’s Mixer is self-contained, though, so you can’t load third-party VSTs or use SD3’s plug-ins within your DAW’s mixer. The Mixer’s multiple output options mean you can still offload mixing duties to your DAW if you prefer. There are over 30 effects included for use within the SD3 Mixer and the quality is uniformly high. Two further features are worth covering here. First, while SD3’s new kits require a bigger RAM footprint than those of SD2, when running both alongside each other I didn’t really get a sense that SD3 was massively more demanding. However, if that does become an issue, you could always use the comprehensive suite of options for rendering out (bouncing) your drums to audio. These are accessed from the Song Track pane’s Track menu and, whether you want a simple stereo mix or separate audio files of every drum mic and ambience channel bounced either with/without effects and with/without bleed, the choice is yours. Second is the Macro Controls. These can be opened via the button to the right of the transport controls and are displayed in banks of five (100 are available in total). SD3 parameters such as Mixer or effects controls, or drum parameters such as the envelope decay times or tuning, can be assigned to these rotary knobs. Usefully, you can link multiple parameters to a single Macro Control and, of course, you can link the Macro Controls to an external MIDI control surface or automate them from your DAW/sequencer. A number of the kit presets make good use of these and the potential is obvious. This is ably illustrated by one of the tutorial videos shipped with my review package that shows a Macro Control used to control amplitude envelope decay time; it provided a brilliant way to add extra dynamics in different sections of a performance. Superior Drummer has always excelled in the creation of a complete drum performance from scratch with no actual drummer required. However, in SD3, it can also perform another valuable role: drum replacement. This functionality is contained within the Tracker screen, and I think it is fair to say that Toontrack have knocked it right out of the park first time with this brand-new element. George Massenburg and drummer Norman Garschke.The process starts by simply dragging and dropping your own multitrack drum recordings into the Tracker window (just use the main, close mics, for the clearest and cleanest drum/transient identification). 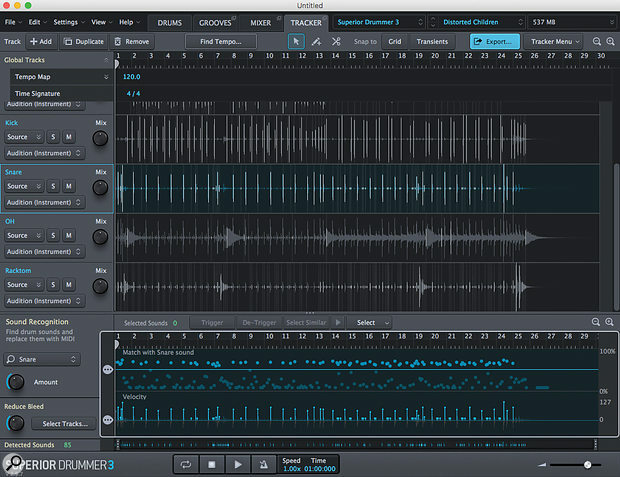 Tracker then uses some very sophisticated AI-based algorithms, first to identify the type of drum (kick, snare, hi-hat, tom and so on) that dominates each track and, second, to detect the transients for that drum sound while ignoring transients from other sounds that have bled into that track. 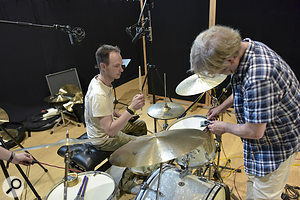 Having tried this with a few multitrack drum recordings of my own, I was very impressed with the results that SD3 achieved without any intervention on my part and, in particular, by how well the algorithm handles multiple hi-hat articulations and captures the playing dynamics of the original performance. However, if the default settings don’t get things just how you want them, there is a huge amount of user control available. This includes being able to change SD3’s identification of the dominant drum in each track; settings for refining how transients are identified as genuine ‘hits’ for each drum; the ability to split tracks into sections and specify different detection settings within each section; manual selection/deselection of hits; and a very clever system for identifying hits that are bleed from another channel to make those easier to ignore. And while doing all of this editing, you can audition playback with the Mix knobs on each track, blending between the original audio and SD3’s ‘replacement’ sounds. Tracker also provides tools for defining the original tempo and generating a tempo map from the audio recordings. Finally, the Export button (located top right) lets you drag the generated MIDI — either as a combined MIDI clip with all drum hits, or on a per-drum basis — into the Song Track, from where you can use all of SD3’s MIDI editing tools if further refinement is required. While multitracks make Tracker’s job easier, I did give the detection process a spin with a few stereo drum recordings. This is obviously not ideal but, using Tracker’s ‘track duplicate’ function to make multiple versions of your original audio, each version could then be set to identify different drums within the mix. It perhaps required more user input to fine-tune the detection process but the results were remarkably usable. 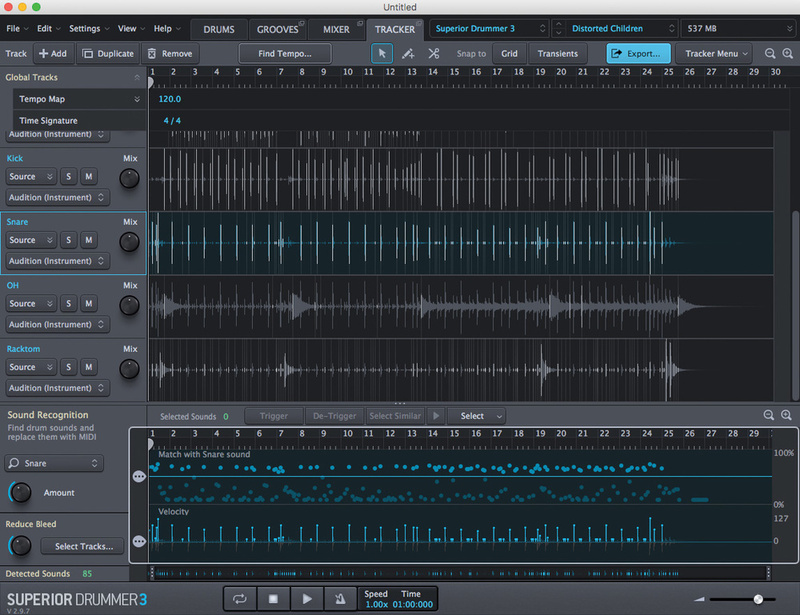 SD3’s new Tracker feature provides a very sophisticated suite of tools for drum replacement and, while designed with multitrack recordings in mind, is also seems to do a pretty decent job with stereo drum recordings. Although I did my testing on a pre-release version of SD3, I have to say that all this sophisticated functionality behaved pretty much flawlessly. I also had no difficulty triggering SD3 from Cubase, my MIDI keyboard or a Roland V-Drum kit. The MIDI In/E-Drums tab of the Settings menu provides plentiful configuration options here but, having selected the Roland preset, and made some minor remapping tweaks, this worked very smoothly. Auditioning this new virtual drummer was, therefore, a real pleasure. SD3 is feature-rich, has an excellent MIDI groove library, brilliant tools for building a complete song-format drum performance, great mixing options and a comprehensive drum replacement feature. All of that is fantastic, but I’ve saved the actual best until last: Superior Drummer’s new drum kits sound absolutely incredible. Superior Drummer 2 already sounded great, but there is almost an extra dimension to SD3’s new core kits. They really do feel like they are in the room with you or, perhaps more accurately, you are in the room with them, because the options for fine-tuning the room ambience are almost limitless and the sense of ‘room’ totally believable. Every sound feels absolutely pristine (unless, of course, a preset includes effects that deliberately aim for a more grungy feel), and the kick drums particularly striking. Hold on to your subwoofers, because there is some serious bottom-end punch available here. Toontrack have also done a great job with the range of presets supplied, which demonstrate that the six new kits can actually cover a huge range of musical styles. The electronic drum and percussion sounds are also very good and, whether used alone or ‘stacked’ with the acoustic sounds (go on, add even more bottom end to your kick), they are a very worthwhile addition to the overall package. While the impressiveness of the sound is no doubt partly the result of Superior Drummer 3’s improved audio engine, that engine is undoubtedly capitalising upon the quality of the new samples. Loading SD2 kit (or expansion kit) presets into SD3 worked absolutely fine but, having done some side-by-side tests, the actual sound was identical to when that same kit was played within SD2. It’s an obvious thing to say, but the more sophisticated sampling process used for the new SD3 kits delivers a very noticeable step up. Sonically, Superior Drummer 3 is undoubtedly superior. Real drummer or virtual drummer? It’s true that a real drummer brings a particular vibe to a recording that is inherently ‘human’, and that this individuality is often very difficult to replicate with software. However, in sonic terms, SD3 delivers drum tracks that sound incredibly realistic at a fraction of the price that the combination of a top studio, top kit, top drummer and top engineer would entail, and it does it with a very modest amount of effort. Jobbing session drummers really would need to bring their triple A-game to compete with this. As an all-round virtual drummer package, SD2 was always competitive and, over the years, became an incredibly popular choice despite some very able alternatives (perhaps most notably BDF3). However, I think SD3 takes the virtual drummer concept to a completely new level and, while the price might be a barrier to some, it is undoubtedly well worth it. Toontrack have got an absolutely nailed-on winner here, and all I can say is that I feel sorry for session drummers who are looking for work. 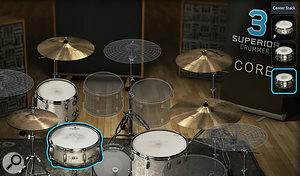 There are some established alternatives in the virtual drummer category including XLN Audio’s Addictive Drums 2, Steven Slate Drums 4 and NI’s Studio Drummer (all cheaper than SD3 for their core package) but perhaps the closest competitor in terms of features is FXpansion’s BFD3 (a similar price to SD3). All of these are capable of creating great drum tracks, but I think the overall package offered by SD3, while at the top end of the price range amongst these products, has seriously raised the bar. It will be very interesting to see how Toontrack’s rivals respond. As a drummer with the enviable facility to record real drums, I don’t generally gravitate toward drum software. I rarely program ‘real’ drums or use preset grooves, so there are areas of the new Superior Drummer that intrigue me more than others. Initially, I chose to check out the brand-new 230GB library by triggering the sounds from an electronic kit — essentially playing SD3 ‘live’. Although I have a number of different real-world drums and mics available, they don’t match the range and quality on offer in SD3. First impression: it sounds amazing! The levels of articulation and detail available are exceptional. The drums allow for incredibly dynamic playing, with grace notes being reproduced perfectly and the drums really opening up as you hit harder. ‘Playing’ SD3 feels so natural that it was easy for me to forget I wasn’t playing a real kit. 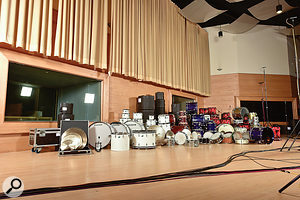 The huge choice of drums available is fantastic. I had endless fun auditioning snares I have no hope of ever owning, each one beautifully recorded and giving an incredible tonal palette of sounds. A major part of what makes a ‘drum sound’ is the room, and SD3 excels in this area with 11 ambient mics, all controllable via the mixer. The ability to introduce bleed individually into any or all of the room mics makes for almost endless possibilities and brings to life what are already amazing-sounding kits. Drum replacement is a great way to augment an existing drum track, and is something I often do, so I was keen to check out the new Tracker feature. The interface couldn’t be simpler to use and the results are almost instant. During my tests, SD3 processed WAV files (kick, snare, hi-hat and three toms) in seconds, picking up the majority of the ‘hits’ without any user intervention. You might expect something like a hi-hat, with all of its various articulations and spill from the snare and other drums, to be almost impossible to ‘replace’. Astonishingly, without doing much more than adjusting the threshold I was able to achieve very good results, with open hats and dynamics being tracked really well. Being able to then go in and adjust each hit on a note-by-note basis, applying just the right articulation, makes creating a perfectly tracked replacement drum part a breeze. Brilliant workflow for drum part construction. Enhanced mixing and effects options. The new acoustic kits sound incredible. More expensive than SD2 (but certainly great value for money). Will undoubtedly mean less work for real drummers. 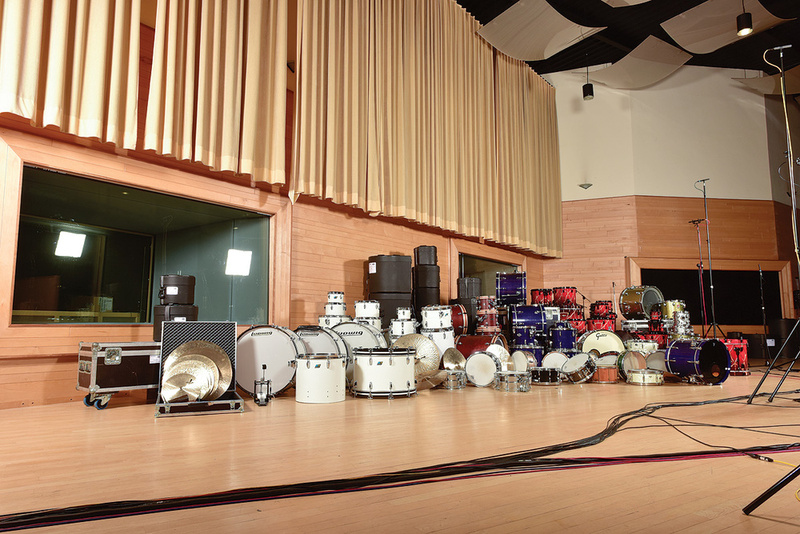 You’ll have the problem of making everything else in your mix sound as good as the drums. 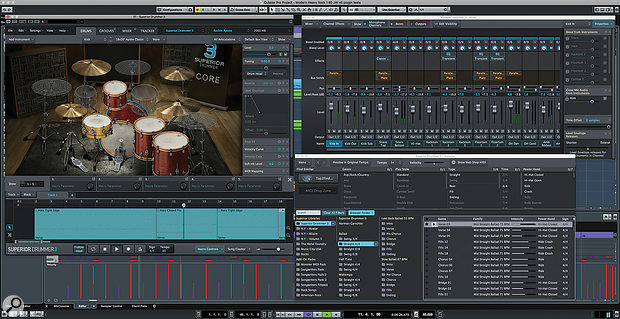 Toontrack have just redefined the virtual drummer with Superior Drummer 3. It is technically brilliant, but the real triumph is the sound: deep, detailed, utterly believable and, in sonic terms, practically impossible to beat in your own studio. Superior Drummer 3 £287; upgrades from £147; crossgrades from £217; library on SSD £165. Prices include VAT. 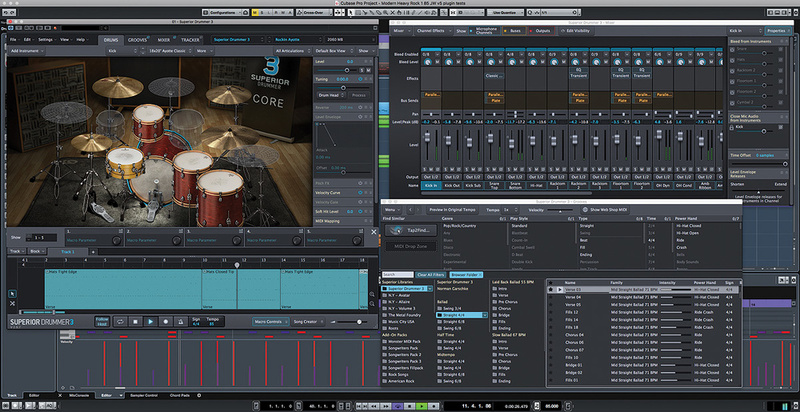 Superior Drummer 3 $419; upgrades from $209; crossgrades from $319; library on SSD $199. Apple iMac running OS 10.12.5, 3.5GHz Intel Core i7, 32GB RAM.